I am Zane Saenz and I'm 14 years old and I live near the North Shore of Oahu. I am mainly a SUP racer and SUP surfer but I also paddle outrigger and recently started SUP foiling and I love it. I'm in the water doing something everyday because this connection with the ocean makes me really happy. I live in a cool small town in the country side of the island where there is lush green mountains, and 200-300 yards from the mountains there is the ocean. It is awesome to see the mountains while paddling and training. I got started in SUP surf and racing when I was 8 years old in 2008 at the Battle of the Paddle. A big-wave mural artist and paddler/waterman Hilton Alves introduced me to SUP. He also trained me to do my first long distance race, the Dahui Independence race on a longboard. He found a thick 6’0” short board for me to learn how to SUP surf on and that was it, I learned to love it even more than regular surfing. I loved paddling and have never stopped doing it. This June I had the opportunity to participate in the 2018 USA SUP Surfing Championships in Oceanside California. It was such an awesome event, with some huge swell in Oceanside, and was very different of how everyone anticipated the conditions would be.We were at first pretty disappointed when the surf report showed almost flat surfing conditions the entire week before, but surprisingly, the day of the contest, buoy readings showed 6-8 feet swells at 18 second intervals, meaning powerful and well overhead surf would greet the competitors at the beachbreak. Luckily I brought my Blue Planet stepup board, because these powerful waves really needed a bigger board. I arrived in Oceanside the day before the contest to get a practice surf at the spot as this was my first time ever to surf in California, and I was surprised about the energy of the wave and how difficult it was to get out. The morning of the Championships, the swell was peaking and the wind was low. My first heat was with the adults, Sean Poynter and Daniel Hughes. I was so excited for the opportunity to meet and surf with these professional competitors I look up to, even though technically I wasn’t surfing against them because I was only surfing against my division. It looked very difficult to get out, so I got to the lineup by walking a little up the jetty (rock wall) and jumping off the harbor side, where the waves weren’t breaking, and paddle around to the lineup. I got there fairly easily, and soon enough the other competitors were there too, and the heat started. Soon enough a set came and we all caught waves in the set. Sean got lucky and was able to paddle back out, but me and Daniel got stuck for almost ten minutes! We had to wait along the Jetty for the waves to stop, then we could paddle out and catch a couple more waves before the fairly short, 20 minute heat ended. On my second heat with adults, I had to paddle out to the lineup through the waves because the lifeguard said we couldn’t jump off the jetty anymore. Luckily I figured out how to paddle out, and the heat had absolutely pumping waves and I caught a couple big waves, but also a lot of big wipeouts and a lot of waves on the head. I’m glad the juniors got to surf with the adults because I learned a lot about the wave, going out to the lineup, and which waves to catch. It was also fun to talk story with everyone, get to know everyone, and make new friends! Right after I finished my second heat, I realized my U18 final was the next heat, so I got my new jersey and started paddling back out to the lineup. I got out fairly easily and I heard the horn sound. I started surfing for a while, but after catching a lot of great waves I realized I was the only one surfing, so I paddled back to the beach. I had two hours of rest before the final heat, which I really needed because I was surfing, paddling, and wiping out in the heavy conditions for about an hour and a half! The missing competitor, Gavin, showed up and we started the heats for the finals. The waves in this heat were some of the biggest I saw that day, and the tide was lower so many of the huge set waves were closeouts and didn’t have much potential. I was the only one that was able to paddle out to the lineup and catch the bigger waves with excellent potential. The big waves actually gave me an advantage, because I saw the others were really good at surfing smaller waves, but the waves on the inside didn’t have nearly enough potential, power, and length of the bigger outside waves. I caught a set wave, but I got stuck on the inside in what felt like a never-ending set. I paddled out near the jetty, but the current sucked me in front of it and all of a sudden I was taking waves to the head right in front of the rocks. I was able to prone paddle to the harbor side and escape the set (which was fairly easy with my lightweight Kialoa paddle), and I paddled around to the lineup. I was able to catch one more good wave before the heat ended, and I went in. I was not sure about my results but was so happy when I heard on the speakers that I won! Thanks to USA Surfing for putting on such an awesome event, and all the competitors to be such cool guys to hang out with and talk story! 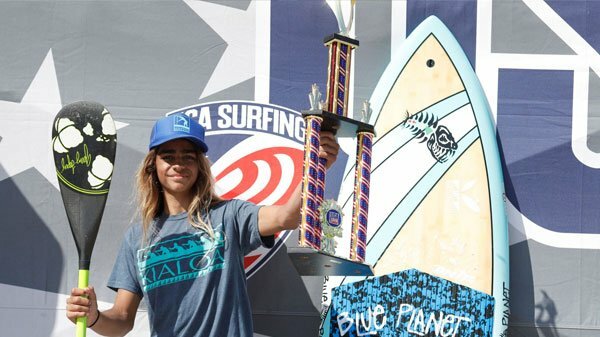 Thanks to all my sponsors for the support Kialoa Paddles, Blue Planet Surf, OnIt Pro, Raw Elements for this amazing opportunity!